So, lots of people are turning their Twitter & Facebook icons hexadecimal color #009900. (Take that Pantone corporation!) Through some lazyGoogling I discovered the significance of this. The color in this form is the shade of green used in the Flag of the Organization of the Islamic Conference. Islam used/uses this shade of green symbolically because the tribe of the prophet Muhammad had a green banner and because to them green represented paradise (the Persian word for garden) to desert-dwelling Bedouin tribes when they gathered at an oasis. Islam venerates the color, and it expects paradise to be full of lush greenery. Many flags of the Islamic world are green, as the color is considered sacred in Islam. Through some additional lazyGoogling I read a bit about the social networking campaign. I’m definitely suspect about whether a million hexadecimal avatars will change a damn thing. This discussion that appears on The Washington Post strikes a dubious note as to Twitter’s utility as a political tool; this piece on Slate is downright cynical. My guess is that the most disturbing aspect of the Iranian protests to those in power is that people are taking to the streets not that they’re Twittering. It’s certainly a good marketing move for the activists and for Twitter itself, though. If Twitter feeds are ineffective then arty YouTube videos about this situation are almost certainly useless in changing the world. I like arty videos, though, and this one made me stop to think for a second. Thought is indeed capable of changing things, when transmuted into action. 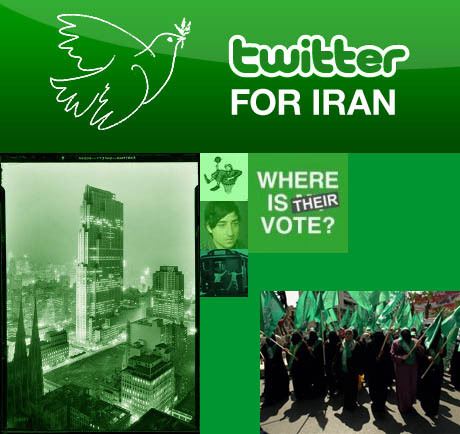 Use this site by Arik Fraimovich if your avatar is green with Iranian activist envy. UPDATED JUNE 22, 2009: A version of the same video as seen above without soundtrack after the jump.